Brookite (Tio2) is a reddish-brown to black mineral consisting of titanium oxide in orthorhombic crystalline form: occurs in silica veins. It is one of the three main forms of titanium dioxide. 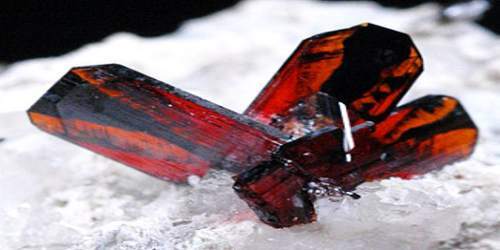 It forms distinct and unique crystals, and is often associated with the two other minerals it is polymorphous with, Rutile and Anatase. Brookite almost always forms together with Quartz, and is occasionally entirely included within a Quartz crystal. It has a larger cell volume than either anatase or rutile, with 8 TiO2 groups per unit cell, compared with 4 for anatase and 2 for rutile. Iron Fe, tantalum Ta and niobium Nb are common impurities. Brookite belongs to the orthorhombic dipyramidal crystal class 2/m 2/m 2/m (also designated mmm). The space group is Pcab and the unit cell parameters are a = 5.4558 Å, b = 9.1819 Å and c = 5.1429 Å. The formula is TiO2, with 8 formula units per unit cell (Z = 8). Brookite is typically occurs as brown, metallic crystals in veins in gneiss and schist; it is also found in placer deposits and, less commonly, in zones of contact metamorphism. It is widespread in veins in the Alps; in Fronolen, north Wales, it forms crystals on crevice walls in diabase. Brookite forms crystals that belong to the orthorhombic system. Its colors are reddish-brown, brown, yellow-brown, yellow-orange, greenish-gray, and black. Often has a lighter and darker color zone, or a black zone running through the center of a crystal. These crystals may be standalone, or in platy aggregates or bladed. It is often associated with minerals such as anatase, rutile, titanite, chlorite, orthoclase, hematite, calcite, quartz, and muscovite. Its crystals may also be bipyramidal or pseudohexagonal, as well as in equant stubby crystals. Crystals are usually microscopic to very small, except at a few localities where they occur in larger crystals. Crystals are usually striated. 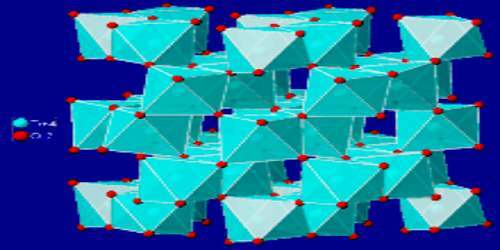 The brookite structure is built up of distorted octahedra with a titanium ion at the center and oxygen ions at each of the six vertices. Each octahedron shares three edges with adjoining octahedra, forming an orthorhombic structure. The density of brookite is 4.1 to 4.14 g/cm3 with a hardness of 5.5 to 6 – between a knife blade and orthoclase. 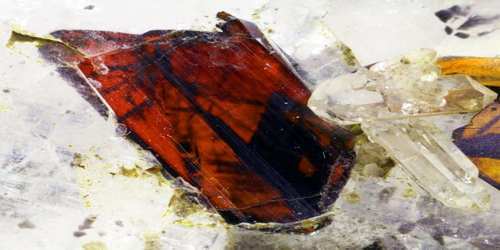 Brookite is a brittle mineral, with a subconchoidal to irregular fracture and poor cleavage in one direction parallel to the c crystal axis and traces of cleavage in a direction perpendicular to both the a and the b crystal axes. Twinning is uncertain. The mineral has a Mohs hardness of 5½ to 6, between apatite and feldspar. This is the same hardness as anatase and a little less than that of rutile (6 to 6½). The specific gravity is 4.08 to 4.18, between that of anatase at 3.9 and rutile at 4.2. In low temperature alpine Quartz veins and cavities in metamorphosed schists and gneiss, in hydrothermal vein deposits, and in placer deposits. 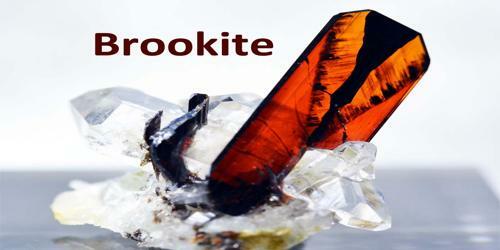 Brookite is a rare collector mineral and is desired by collectors, especially good crystals.